An old olive tree is creaking. It’s not the wind, but the sound of a tree frog singing from somewhere inside the hollow trunk. The warm humid October weather suits Mediterranean tree frogs, and they appear on the dew-saturated leaves, in bushes and flower beds. Some had shimmied up the newly blooming Red hot pokers. Migrating song thrushes have settled unobtrusively on the hill. You’re aware of them but they hide out of sight, communicating with low calls. Other arrivals are chiffchaffs. They’re far less shy, too small to fear the shotgun. I’m going along the cobbled path to the Sot del Migdia, and feel watched. Just above me, I see tall ears, and a prominent brown eye. 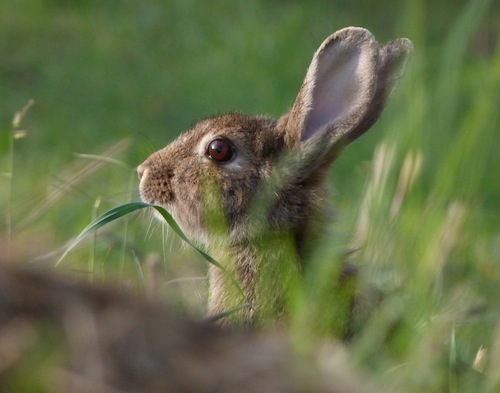 It’s a boom year for rabbits on Montjuic – newly excavated warrens are gaping. They’ll be glad summer’s over, and the arid slopes have turned green, not so much from rain, which has been scarce, but from the heavy dew. The aim of this Barcelona-based blog is to take a close look at nature in a densely populated metropolitan area. 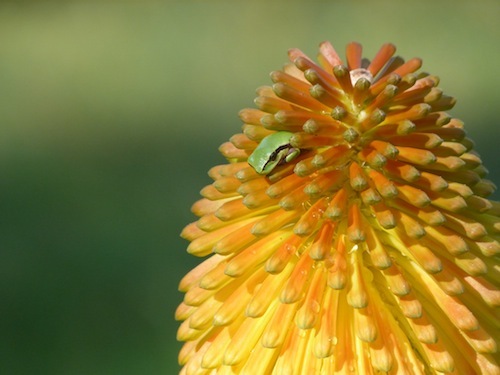 Dip into the blog and you’ll find an astonishing diversity of species, many within walking distance of a metro station. The photo is indistinct, but the animal unmistakable. It was taken last February by Ferran Jordà on a cold grey day near Queralbs in the Catalan Pyrenees. The wolf observed belongs to the subspecies Canis lupus italicus. Signs of lone wolves have been found in Catalunya in the last ten years, but such photos are rare. Then in July, a French family came across a wolf in the vicinity of Puig Mal, and, with camera equipment to hand, were able to record a brief but incredibly close encounter. 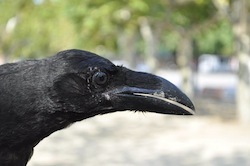 Strongly associated with wilderness, when ravens turned up in the intensely urban environment of Barcelona this summer, it caused surprise and excitement. Two young ravens, still weak flyers, were rescued off the street, and set free after a couple of weeks in a wildlife recuperation centre. Regular observations of ravens have been made in the area of Park Ciutadella throughout the summer. By coincidence, ravens have also made an appearance in Manhattan this year. More photos and information from Galanthus. The autumnal migration of cranes (Grus grus) into Spain usually takes place inland, over the Pyrenees. On the last weekend of October there was an abrupt change in the weather, with temperatures plummeting and an extremely strong north wind. On Ornitho.cat, someone in Sant Andreu de la Barca (near Barcelona) recorded hearing cranes passing at 3 in the morning. This was only the beginning. While walking in Collserola on Sunday morning, an unmistakable trumpeting made me look up to see a group of 22 cranes, circling and orienting themselves in a SW direction. The observations on Ornitho.cat came thick and fast during the day. One entry from the Delta del Ebro recorded 1,300, the observer noting the whole sky covered with skeins. The map from Ornitho.cat (yellow= 28th Oct, red = 29th) reflects this remarkable event, when the weather conditions forced the cranes into an intense coastal passage, well to the east of their usual route, much to the delight of ground witnesses. It’s the time of year for unusual sightings in unexpected places. Recent observations recorded on Ornitho.cat include 28 Booted Eagles heading northwest and 2 Ospreys southwest, seen by an observer on a roof in the middle of Barcelona. In Sallent a goshawk was seen eating a mallard and a Black Stork was wheeling over Tordera. 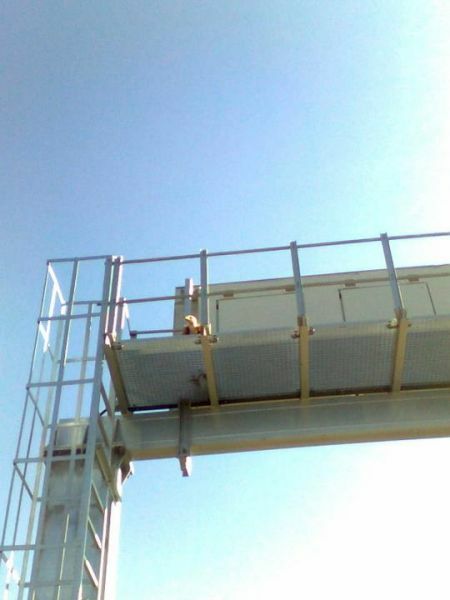 And someone snapped this Griffon vulture on a structure over a busy road near Montserrat. Shortly after being born, this year’s brood of Peregrine falcon chicks were stolen from their nest in one of the Sagrada Familia towers. The robbery took place out of range of the web cam installed. Visitors have no access to this tower, but there are always plenty of workers milling around, since the Sagrada Familia is still under construction. Eduard Durany, responsible for monitoring Barcelona’s Peregrine falcons, emphasises the need for better security. Last year suspicious individuals were spotted trying to take food up to the falcons, who fetch a high price on the black market. After the theft, two chicks born in a wildlife recuperation centre were placed in the nest, but sadly the intended foster parents rejected them. 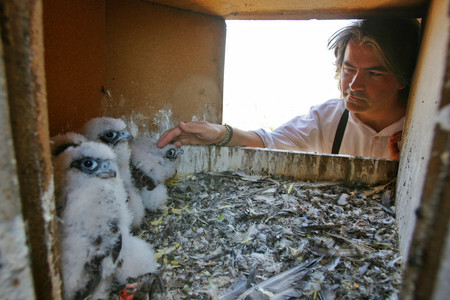 See also the report on the ringing of Montjuic’s young falcons. After considerable procrastination, Collserola, often described as Barcelona’s lung, has been officially declared a natural park. With an estimated 2 million visitors a year, Collserola becomes Spain’s second most visited natural park, after the Teide in the Canary Islands. Maybe it’s also the most unusual, as its wildness exists among ubiquitous electricity pylons, a motorway, a cemetery, and the houses of 15,000 inhabitants. What changes will this new status bring? An increased budget and size, as the park area is due to be extended by 700 hectares to a total of 8,295. 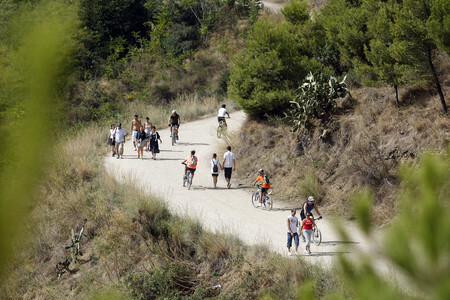 New rules for the metropolitan urbanites who escape to Collserola’s woods will be announced shortly. Whooping, hollering, silence-shattering kamikaze mountain bikers, the bane of hikers, will apparently be subjected to stricter control. It will be interesting to see if the urbanising tentacles of the various municipalities that share Collserola will also be brought under control. The areas of Barcelona nearest to the Collserola hills are now quite used to visits from the natural park’s thriving boar population, particularly at the end of summer when the ground is rock-hard and food supplies scarce. But on Saturday night a family of boars was seen trotting through Gràcia, a central barrio of the city, accessible only after crossing an extremely busy ring road. The same family has been observed this August exploring Gaudí’s Güell Park. There’s a video from TV3 showing the police herding the ungulates through the streets back to the hills. 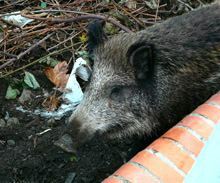 The photo shows a not-so-wild boar of Collserola. The typical tree of the Pyrenees, Pinus uncinata, is spreading in Catalonia, as traditional agricultural and livestock activities decline. In the last 50 years, the Mountain Pine population has grown by 16%, reports the Centre Tecnològic Forestal de Catalunya (CTFC), after a comparative study of aerial photographs. 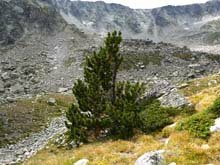 With income in mountain areas increasingly generated by tourism, the Mountain Pine has been free to colonise areas with good growing conditions, unlike the tree in the photo, surviving at the upper limit of its range in the natural park of Aiguestortes and Sant Maurici. 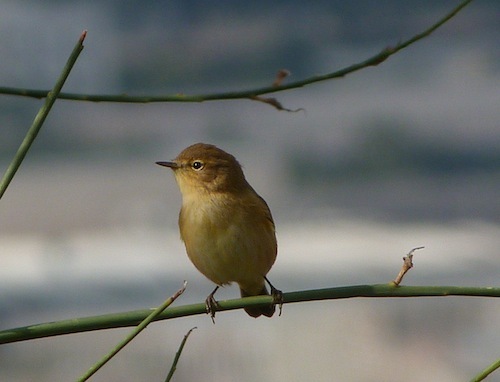 Birders living or travelling in Catalonia can report their sightings on Ornitho.cat – a web page run by ICO, the Catalan Ornithological Institute. While all reports contribute to a very useful data bank, it’s also fun to find out what people are seeing and where. Access to precise data on the following species is restricted: Bearded Vulture (Gypaetus barbatus); Black-bellied Sandgrouse (Pterocles orientalis); Black-winged Kite (Elanus caeruleus): Bonelli’s Eagle (Hieraaetus fasciatus); Egyptian Vulture (Neophron percnopterus); Golden Eagle (Aquila chrysaetos); Lesser Grey Shrike (Lanius minor); Peregrine Falcon (Falco peregrinus); Pin-tailed Sandgrouse (Pterocles alchata); Western Capercaillie (Tetrao urogallus) You can also decide to keep your own sightings hidden. There’s a choice of languages – Catalan, Spanish and English – and an option to add comments and photos. A Mediterranean nature blog is proudly powered by WordPress. Entries (RSS).